In general, I’ll try to refrain from bragging on this blog because no one likes a bragger. But can we make just one tiny exception for this cake? Because you guys. This cake. I DID IT. 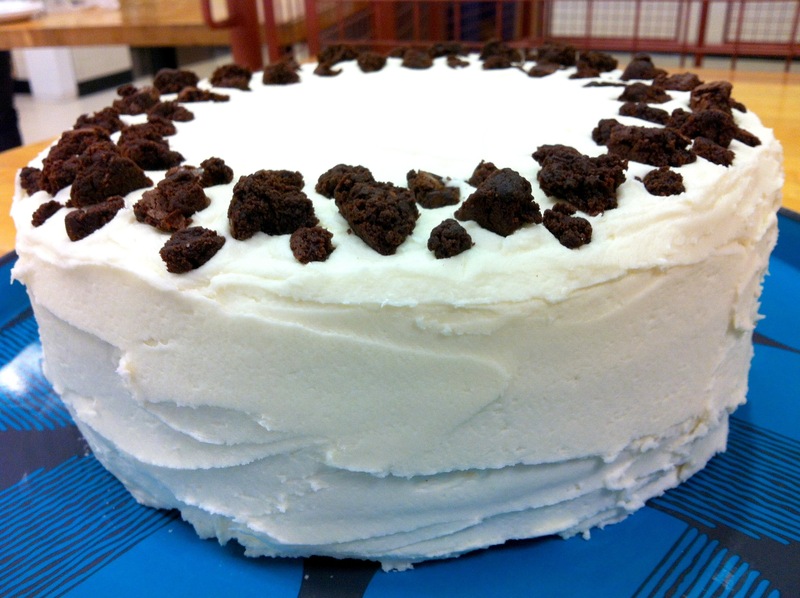 I turned Tosci’s best ice cream flavor into a cake. Do you understand what this means?? Toscanini’s is one of the greatest ice cream places in the world. It’s true – numerous national sources have touted the awesomeness of their frozen treats. And at Tosci’s (which is a dangerously short walk from my apartment…), you can get the greatest ice cream flavor known to humankind: B^3. AKA B cubed. AKA brown sugar, browned butter, and brownies. AKA taste bud bliss. I had this ice cream during grad school visits and it just about sealed the deal. Forget the interesting research, fancy lab equipment, awesome department, the chance to try out the east coast… It’s really about Tosci’s and B^3. That is how good this ice cream is. And now you can have this trifecta of glorious flavor in your own home even if you can’t visit Tosci’s whenever you please, and all because I love you and am sharing this magical recipe with you. Try not to make this cake every week, okay? It’ll be hard, I know. But do your best. With great power comes great responsibility and all that jazz. 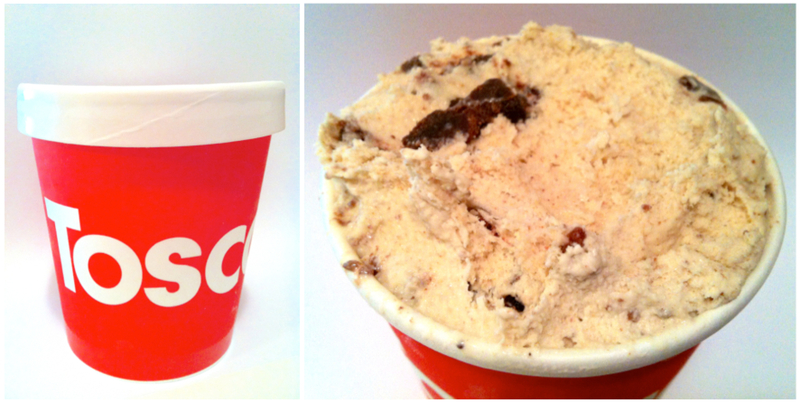 Because I am such a dedicated baker, I sacrificed my waistline for the greater good and bought a pint of Tosci’s B^3. Quality assurance taste testing and all that, right? I had to make sure I captured the flavors properly! Side-by-side, eating the cake batter and ice cream, the only discernible difference is the temperature. Oh my, what a success! Also, I would be remiss if I did not mention one of my phenomenal pen pals, who generously sent me a gift card to Williams-Sonoma (fancy pants, right?!). I used it to get an offset spatula (among other to-be-shared goodies) and let me put it this way: if you don’t have an offset spatula and you plan on making more than one cake in the future, get yourself to any home goods store and buy one right now. It is magic. Seriously. I always figured it was just an extra tool to use but I could exist just fine with a normal knife/spatula… I can’t believe it took me this long to realize what I’ve been missing! Thanks a million, Lauren!! I was singing your praises the entire time I frosted (which was longer than usual because I was having so much fun), and it’ll make me think of you every time I make a cake from now on! AND on top of that, I came into lab today only to discover that the amazing people in my department banded together to get me a super snazzy, just-what-I-needed cake and cupcake carrier so I no longer have to bring my treats to lab in questionable homemade covers. Plus they got me a gift card to the grocery store to keep buying supplies, since I’ve been essentially keeping the local baking supplies economy afloat lately. So in case you were wondering, the answer is yes, I do have the best lab/department-mates EVER!!! Goodness, all this generosity is overwhelming. How did I get so darn lucky?! Okay, brag time over. Thanks for letting me get away with that. For your patience, I have the perfect reward for you: B^3 Cake. Il est fantastique! Use ingredients from my previous post or substitute any 8×8-inch brownie recipe. 1. Make according to my previously posted instructions, or use any brownie recipe you like (about 8×8-inch size). 2. Cut off the edges (hang onto these and eat with the leftover frosting), and crumble the middle into small pieces about the size of jelly beans. Set aside. 1. Preheat oven to 350 F. Grease three 9-inch round cake pans well (bottom and sides) with baking spray. Cut parchment or wax paper in a circle to fit the bottom of the cake pan, place on top of the greased bottom, and grease the paper. 3. In a medium bowl, sift together flour, baking powder, baking soda, and salt. Set aside. 5. Beat in eggs in pairs, until well-mixed. Add oil, sour cream, and vanilla and beat until smooth and well-mixed. 6. Add dry ingredients in thirds, beating just until each addition is incorporated. 7. Divide the batter between the three prepared pans. Reserve 1/2 cup of brownie crumbles and divide the remaining crumbles between the three pans and sprinkle over the top. Press the brownies down into the batter; try to cover them as best you can with batter. 8. Bake in the oven at 350 F for 25-30 minutes, until a toothpick inserted in the center comes out almost clean (they will get pretty brown on top). *Note: I did 30 minutes and thought it was a bit too dry for my liking, so I recommend removing them sooner. Alternately, follow the syrup suggestion in this article to add moisture back to your cake before you frost it. 9. Cool the cakes in their pans on wire racks for about half an hour then remove cakes (and paper circles) and place them in the fridge. 1. Place 1/2 cup unsalted butter (non-browned) in the bowl of a stand mixer. 2. Brown 3/4 cup unsalted butter. Let it settle for a few minutes, then pour the top (clear-ish) butter over top of the non-browned butter. Discard the last bit of butter that has all the brown flecks. 3. Stir the butters together until the non-browned sticks melt almost entirely. If you have time, let this mixture sit and harden for a little bit (the fridge can help). 4. Attach the bowl to your stand mixer. Alternate adding tablespoons of milk and cups of powdered sugar. Add the vanilla extract near the end. Cream the frosting until it’s soft, fluffy, and well-mixed. 1. Frost according to the instructions in my Cinnamon-Swirled Banana Cake. 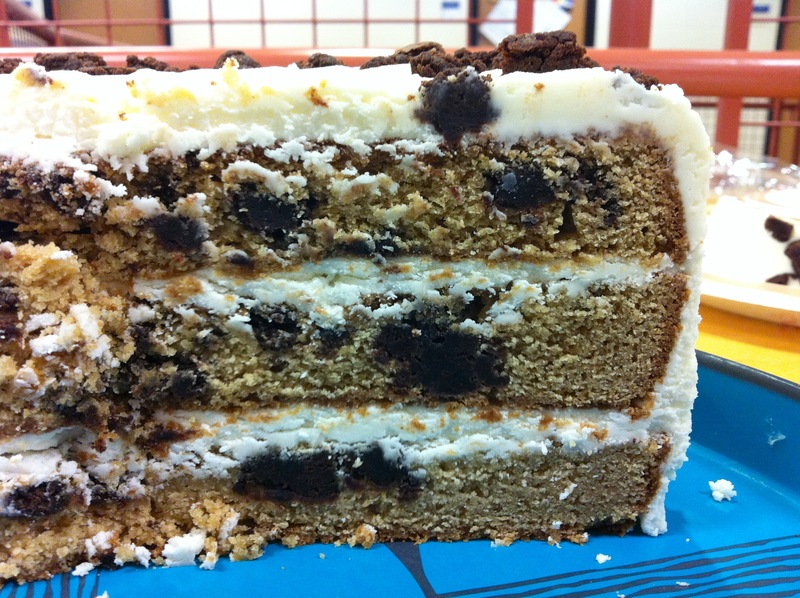 Make sure you do the crumb coat! 2. 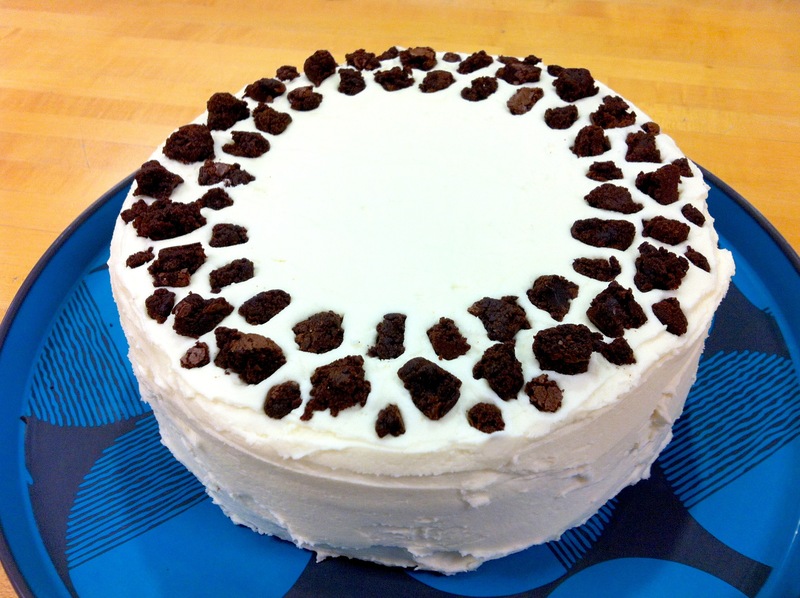 Decorate with the reserved brownie crumbles. 3. Keep refrigerated until ready to eat; remove at least 1 hour prior to serving. Cut small slices; this cake is rich, sugary, and decadent!